Journalists from all six of the media organizations that formed a consortium to hold Monday night’s historic English debate fact-checked several of the statements made by the party leaders. Here’s what they found. Giordano Cescutti (GC) is a video journalist with CityNews Montreal. Sarah Deshaies (SD) is producer of the Andrew Carter Morning Show on CJAD 800. Kalina Laframboise (KL) is an online producer with Global Montreal. Max Harrold (MH) is an assignment editor and reporter for CTV Montreal. Kamila Hinkson (KH) is a web journalist at CBC Montreal. Andy Riga (AR) is a reporter at the Montreal Gazette. Claim: François Legault said only 59 per cent of Quebecers are able to see a family doctor on the same day or the next day. (AR): The most recent statistics available are from 2011, when the Institut de la statistique du Québec (ISQ) found that 59 per cent of Quebecers reported "being able to see a doctor the same day or the next day at the usual place of care." The ISQ report also found that only about one quarter — 27 per cent — reported being able do so in the evening or on the weekend. More recent statistics — from 2013-2014 — indicate that 75 per cent of Quebecers aged 12 and older have access to a family doctor. But the more recent figures do not specify how long it takes to see their doctor. Claim: François ​Legault said medical specialists in Quebec earn more than in Ontario. (MH): Quebec specialists earned, on average, $403,537 in 2016, according to the Canadian Institute for Health Information. Ontario specialists made $367,154 that year. So Quebec specialists earned $36,383 more. Quebec specialists are the third-highest paid in Canada (PEI and the Yukon are first and second, respectively). Ontario doctors rank sixth. The Quebec pay hikes come after years of comparatively low pay for specialists. In 2003 Quebec specialists were paid 30 per cent less than their counterparts in Ontario. Claim: François Legault said children with special needs have to wait six months for diagnosis and six months for services. (GC): According to Autisme Montreal, the waiting time for hospitals to make developmental disorder diagnoses is generally six months to a year. A CLSC can then recommend services with the appropriate institution. The services include: applied behavioural analysis for 20 hours a week, educators who can offer tips to parents on how to structure their child at home and manage their acquired skills, and socio-professional services. However, each of those public services has a minimum wait list of one year for children with autism spectrum disorder. In terms of assistance for parents, they can receive a supplement of $192 a month if they have a child under the age of 18 with an impairment or mental function disability. It takes generally four months to process an application that is complete (Source: Retraite Quebec). Claim: Both François Legault and Jean-François Lisée accused Philippe Couillard of wanting to eliminate school board elections three years ago. (GC): On Sep. 15, 2015, Couillard told reporters at the National Assembly that school boards would likely be abolished. "What we want to do is shift the centre of gravity of the system towards the school, the teachers and the parents," Couillard said at the time. On Nov. 11, 2015, Education Minister François Blais introduced Bill 72 to suspend all school board byelections in Quebec. On Dec. 4, 2015, Bill 86 was tabled to alter school boards, giving schools a greater say in decision-making. Talking about the school board elections again in Nov. 2015, Couillard told reporters at the National Assembly: "What do we want to achieve? We want to give true power to the schools, to the classrooms, to the teachers, to the parents, to the school principals. It should have been done a long time ago. It's time to do it now." Faced with fierce opposition, Bill 86 was dropped in May 2016. Claim: François Legault said the voter turnout rate for school board elections is less than 20 per cent. (AR): In the 2014 school board elections, the overall voter turnout rate was 5.5 per cent, according to Elections Quebec. At French-language boards, 4.9 per cent of eligible voters cast ballots. At English-language boards, the participation rate was 16.9 per cent. Claim: François Legault said to Philippe Couillard: "You cut in services for kids having difficulties… I asked you many times in the National Assembly, you told me it was necessary to balance the budget. You don't balance the budget by cutting in aid to children." (SD): In the 2015 budget, the Liberals held the increase in education funding to .2 per cent, which effectively resulted in cuts to education as the increase was well below the inflation rate, which was around four per cent that year. That spring, the Quebec English School Boards Association (QESBA) forecast a three per cent cut to the overall budget, with a shortfall of about $35 million for the English sector. Then-QESBA president David D'Aoust said it "was a budget built on the backs of our students." The Lester B. Pearson School Board warned that it was facing $1.6 million in cuts for non-teaching staff, and it cut librarian posts. The Commission Scolaire de Montreal cut 175 jobs in the 2015-2016 year, including special-education teachers. Claim: François Legault said 20 per cent of schools now offer full French immersion. (KH): Many English schools in Quebec offer French immersion courses — but how many? It's unclear. A total of 13 of 35 elementary schools in the English Montreal School Board, the province's biggest English school board, offer a French immersion program, defined as 68 per cent of instruction happening in French. At least two-thirds of elementary schools in the Lester B. Pearson School Board offer a French immersion program. According to Statistics Canada, 428,625 elementary and secondary students nationwide were enrolled in French immersion programs in 2015-2016. Claim: Both Philippe Couillard and Jean-François Lisée said François Legault will expel immigrants who fail the French and "Quebec values" tests that a Coalition Avenir Québec government would impose. (AR): Legault says it would be up to the federal government to expel immigrants who don't pass the tests because Quebec does not have the power to do so. Legault has said those who fail would not receive a Quebec selection certificate, meaning they could no longer work in the province, and the federal government would be informed of their status. But doubts have been raised about whether Ottawa would deport immigrants who fail the tests. Claim: Philippe Couillard said the rate of immigrants who arrived in Quebec and then moved away is similar to that for immigrants who leave other provinces. François Legault said the rate of those leaving Quebec is 26 per cent. (MH): Of all immigrants who arrived in Quebec between 2004 and 2013, 24.5 per cent had left by 2015, according to the Association of Canadian Studies. According to Statistics Canada, in a cohort study of immigrants who paid taxes in 2010 the rate of immigrants who left Quebec after five years varied between 7.2 per cent and 22 per cent, depending on the category of immigrant. Knowledge of French was a key factor for those staying in Quebec over the long term, according to the Association of Canadian Studies. (SD): After years of stalled development, the McInnis cement factory in Port-Daniel-Gascons was touted as an economic booster for the job-hungry region and a producer of a "greener" cement. Then-premier Pauline Marois announced the go-ahead in January 2014, and Philippe Couillard stuck with it when his party later came to power. Initially, the project promised to create of 400 jobs, but when the plant was inaugurated a year ago, that was revised down to 200. The plant ended up costing $450 million more than the initial budget of $1 billion. The province, along with Investissement Québec and the Caisse de Dépôt, kicked in a total of $575 million in loans and investments to add to private financing. So that would be $2.875 million in public money per position. The plant will produce 1.8 million tonnes of greenhouses gases a year, making it the biggest single emitter in Quebec. A passenger vehicle produces 4.6 tonnes of carbon dioxide yearly. 500,000 vehicles would produce 2.3 million tonnes of emissions. Claim: Philippe Couillard said Quebec's hydroelectricity exports have grown by 35 per cent since 2014. (KL): Couillard is close, but he's a little bit off in his calculations. Hydro-Québec's annual reports show its exports have significantly increased from 2014 to 2017. In 2014, the public utility sold 26.6 terrawatt hours (TWh) in exports. In 2017, exports for the year had increased to 34.9 TWh. In fact, the boost, an 8.3 TWh bump, represents about a 31 per cent increase. It's important to remember this does not include Hydro-Québec's exports for 2018, nor does it take into account its most recent deal to provide power to Massachusetts. The annual report for 2018 will only be available once the year is over. Claim: Manon Massé said Québec Solidaire would introduce quotas to boost the number of visible minorities in the province's public service to reach 13 per cent, which would match the percentage of visible minorities. (AR): As of March 2018, "visible and ethnic minorities" represented 10.5 per cent of the regular and casual workforce in the Quebec public service, compared with 18 per cent of the province's labour force in 2016, according to a recent Quebec government report. Claim: Jean-François Lisée said: "We lose 30,000 people a year leaving Quebec." (KL): This is unlikely, according to recent statistics. Information compiled by Statistics Canada for the Association of Canadian Studies shows that between 2011 and 2016, about 7,000 Quebecers per year left for other provinces, for a total loss of 37,000 Quebecers over five years. When it comes to leaving for other countries, the Institut de la statistique du Québec found that 7,600 Quebecers left in 2016 for international locations. It appears the total number of Quebecers leaving was actually closer to 15,000 people per year in 2016. (KH): The "stuff" he's referring to is recyclable materials, and he's right — China doesn't want our stuff. Or anyone's stuff, for that matter. In July 2017, China issued a list of 24 kinds of solid waste that it would no longer accept from anywhere, not just Quebec, as of 2018. It includes textiles, mixed paper shipments and the material used to make plastic bottles. The ban is needed, Beijing said, in order to protect the environment and people's health. It seems what was being shipped over there wasn't clean or sorted properly. According to Karel Ménard, the director of environmental group Front commun québécois pour une gestion écologique des déchets (FCQGED), roughly 60 per cent of the material collected in Quebec is sold abroad, mostly to China. Claim: Jean-François Lisée denied that a PQ motion "condemned or denounced the use of 'Bonjour/Hi'" by workers in Quebec stores. Instead, Lisée said the motion "respectfully invited" people working in stores to use "Bonjour." (AR): When he first brought up the issue in the National Assembly, Lisée referred to the "Hi" part of "Bonjour/Hi" as an "irritant." When Philippe Couillard objected to the use of the word "irritant," Lisée said he would drop that word if Couillard would support the motion. The final wording of the motion, which was passed unanimously, stated that the National Assembly reaffirms French is the official and common language of Quebec and that it recognizes 94 per cent of Quebecers understand French. It then notes Bonjour is one of the most recognized words in the French language and that it "magnificently reflects the hospitality of Quebecers." "As a result, it (the National Assembly) invites all merchants and their employees who have contact with local and international clients to warmly greet them with the word 'Bonjour.'" 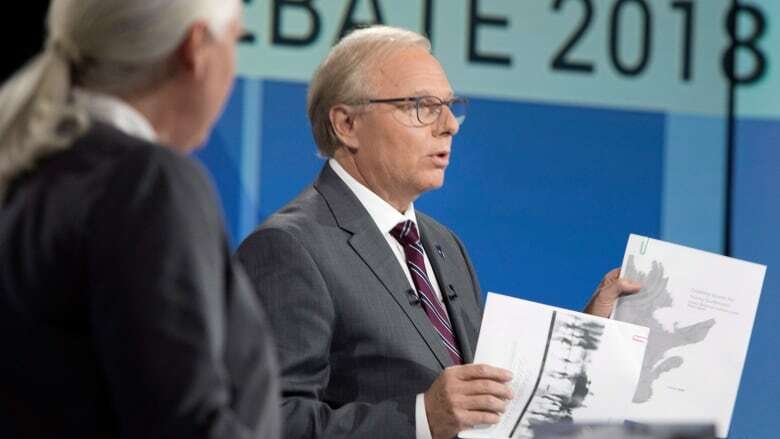 Claim: Jean-François Lisée said he was the first leader to agree to an English-language debate. (AR): This is true. Speaking to reporters in May, Lisée said: "I want to participate in a debate in English, I hope that Philippe Couillard, François Legault and Manon Massé also agree [to participate]," Lisée said. "There is a lot to be said to the anglophone population in Quebec, which is taken for granted by the Liberals." Have a fact you want checked? Let us know in the comments below or drop us a line: webquebec@cbc.ca.